No one wants to attract the attention of thieves. Yet the actions of many vehicle owners practically beg thieves to take a crack at their cars. What are you doing that might tempt thieves? And, just as important, what are you doing to deter them? Lock your vehicle at all times. Even when you’re in it. When choosing their prey, car thieves look for the easiest mark. It doesn’t get much easier than an open car. Etch your Vehicle Identification Number (VIN) into each of the windows. Stolen cars are stripped of their identity for resale. Thieves would rather not replace all the glass. If necessary, take a longer route to avoid high-crime areas. It’s worth the extra few minutes to protect yourself and your car. Park in well-lit areas. This removes the dark and shadowy atmosphere that thieves prefer for their work. Install an anti-theft system. Good options include steering wheel locks, ignition cut-off systems, alarms, and police-signaling systems. Check with your insurance agent to see which systems might make you eligible for a discount on your premium. Leave your keys in your car, and NEVER leave it running unattended. This seems obvious, but many car owners are guilty of this one. Leave valuables visible in your vehicle. Nothing says “smash my window for some quick cash” like a purse, electronic device, or other potential prize sitting out in plain view. Leave ownership information in your car. If a thief steals your vehicle, you don’t want him or her to also have “proof” that they own it. Have you ever wondered why large numbers of kids show up at your door on October 31, dressed in crazy clothing and demanding candy? It does seem a bit bizarre. 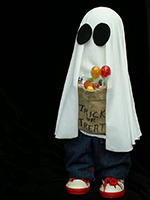 But while it’s always been part of our lives, the trick-or-treat tradition traces its roots way back. Celtic: More than two millennia in the past, Celts celebrated the festival of Samhain on October 31. They believed the dead returned to earth on this day, and gathered to pay homage to the deceased with food offerings. Some villagers dressed in costumes to drive away unwelcome spirits, and from this grew the tradition of dressing as scary creatures and performing antics for food or drink. Christian: Once Christianity spread to Celtic regions, traditions blended and new practices emerged. The church declared November 2, All Souls’ Day, as a time to honor the dead. However, the October 31 traditions of Samhain, such as bonfires and costumes, continued with the added practice of “souling.” In souling, the poor visited the wealthy and received soul cakes for praying for the homeowners’ dead relatives. However, when children took up this practice, they asked homeowners for gifts in exchange for their prayers. In some regions, souling became “guising,” when guising children dressed in costume and performed tricks to collect treats. Today, we don’t make children perform tricks for their candy. Apparently, looking adorable is more than sufficient. Did you know there are days devoted to our feline friends and designed to raise awareness of the number of cats without homes? National Cat Day, which has a strong focus on adopting out homeless cats into loving homes, will be celebrated this month on October 29. And for those with good memories, this is the second such celebration this year: International Cat Day was observed earlier this summer on August 8. There’s no question we love our pets: The American Pet Products Association estimates that we will spend $69.4 billion in 2017 on everything from pet food and vet bills to other services, such as grooming and cat toys. As well, many cat owners are building “catios” – screened-in patios for those catnaps in the sun – or buying cat condos that match their homes’ decors. So, how will you celebrate National Cat Day? Possibly with cuteness overload, by watching the massive number of cat videos online. Or by adopting a kitty for yourself. Or volunteering at a local animal shelter. Or donating food, toys, and blankets to the many cats still waiting for their forever homes. If you’re already a proud cat parent, you can make it a purr-fect day by baking some homemade treats for your own cat. Or give Fluffy or Garfield a relaxing massage, followed by a comb-out session to get rid of all that excess fur (and hairballs). But if you’re not a cat person? Well, you may want to avoid the Internet altogether on October 29. You didn’t set up your guest room for a family of squirrels. Or finish your basement to provide a playroom for mice. Yet, as winter approaches, many pests are seeking a good place to nest for the season. If they choose your home, your property may suffer significant damage. Chewed wires, damaged drywall, and shredded insulation are a few potential problems. Remove the welcome mat: Mice only need a quarter-inch hole to enter your space. And you’d be surprised at the spaces other critters can wriggle into. Some pest management companies may offer a free inspection of your garage, roof, and basement; if any unwanted openings are inviting the outdoors in, complete the necessary repairs or seals to block off access. Quickly. Clear the clutter: Walk around the exterior of your home. Are there piles of trash, leaves, or construction materials around your foundation’s perimeter? Remove them. Piled next to your house, these invite both rodents and bugs to expand into your home. Trim it up: Branches that hang close to your roofline offer easy jumps from trees onto your home. Trim branches away from your house to prevent squirrels from moving in and starting families. This also helps protect your home from the tree itself. In high winds, branches close to your home can easily damage the roof, siding, or windows. Keep pesky critters at bay and avoid the need to make an insurance claim.